- What were the original addresses of houses moved out of the expansion area, and where did the houses wind up? - How many houses were successfully relocated? - Who were the organizers of the relocation effort (if it was planned), and how was Penrose Hospital involved? - Is there a written record of the relocation activity and where is it? Starting about 4/12/17 to check local libraries, I found a Penrose Hospital long range planning document* from 1974 which recommended immediate expansion action to accommodate the rapidly growing city population, and especially for parking space (about 1000 cars by year 2000). I talked with Chris Valentine, of Penrose Hospital Marketing, who said he knew of little or no details of the expansion activity that were tracked for historical purposes by the hospital. 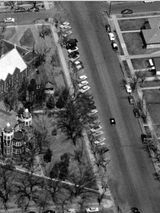 He did say he had donated many photos of the history of the hospital to the Pikes Peak Library District (PPLD), but many had yet to be organized and cataloged there. He emailed me a digital aerial photo from 1940**, showing most of the expansion area. A lady in PPLD Special Collections suggested Building Permits - she showed me a collection of permit stubs up to the early 1960s given to the library by the Pikes Peak Regional Building Department (PPRBD), and said that later permits were available on-line. The stubs included permits for wrecking or moving buildings. I followed up on this, and found that the PPRBD had an on-line database of permits from the early 1990s on, and an on-line archive of photo-copied permit receipts from the early 1960s to early 1990s - these latter covered the time range I was mostly interested in. 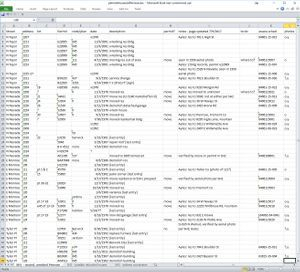 I built a spreadsheet of all addresses in the expansion area having any type of building permit listed, annotating those with wreck or move permits (see "Move / Wreck Permits..." section below). Of the 48 address entries, 12 were move permits, and of these 3 included "move to" addresses. - one was shown to have not been from the expansion area. The PPRBD says that they do not keep additional from/to address information not already noted on building "move" permits. I contacted Professor Bob Loevy, knowledgeable about Colorado Springs history and author of "The Complete History of the Old North End Neighborhood in Colorado Springs, Colorado", August 1, 2010, and "Exploring The Old North End Neighborhood of Colorado Springs, a guide to its history and architecture" by Jennifer Wendler Lovell & Robert D. Loevy, 2010. He was not aware of any other investigation into the movement of houses out of the hospital expansion area, nor of any local planned preservation effort to move houses at that time. He said as far as he knew I was in uncharted territory. It finally stuck me that the County Assessor would be interested in the movement of buildings among properties for property tax purposes. 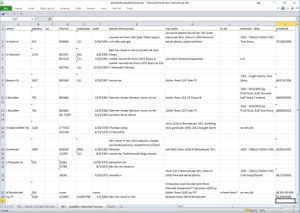 Sure enough, I was put in touch with Ms. Dianna Ayles, Research & Titles Coordinator of the Assessor's Office, and provided her with the two spreadsheets I had prepared (below). She was very thorough in her search, finding about 24 "from/to" addresses (marked "Ayles" in the spreadsheets) not only for the move permits I had listed, but also for many other addresses in the expansion area for which move permits were not found or not applied for. I gave these Moving Houses site pages (with 24 moved houses identified) to local historian Tim Scanlon, retired Colorado Springs Senior Planner, for review, asking him "whether there was any program, organization, or group that actively encouraged, funded or voluntarily assisted in the relocation of some of the houses identified in my project, say for historical preservation or reuse." He referred me to Eric Swab. Eric Swab, also retired and a local historian, worked as Colorado Springs Urban Renewal Effort (CURE) Project Coordinator in the Lower Shooks Run neighborhood from 1972 to 1977. He was responsible for overseeing all the improvement projects that were carried out in the area including the moving of the houses, and acted as a liaison between the neighbors and CURE and the City. Eric remembered moving the house now at 714 E. Moreno from the Penrose Expansion area, resulting in the house being added to this site as another moved house. 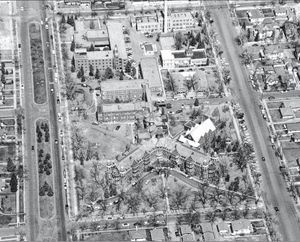 This also led to a search of the Gazette newspaper archives, uncovering the donation by Penrose Hospital to CURE of the two houses now at 714 E Moreno and 524 S Prospect. Eric later worked as Assistant to the Director of the Colorado Springs Community Development Department from 1977 to 1987. He recalls the move of the buildings from the Penrose Expansion area to 702 & 704 E Boulder Street and now owned by the City, funded by a Community Development Block Grant (CDBG), a Housing and Urban Development program for inner city redevelopment. Originally, the house at 704 was used for offices of the Urban Renewal rehabilitation staff, and one at 702 was used for offices of the CETA staff. CETA stood for Comprehensive Employment and Training Act, a U. S. Department of Labor program. As part of an evaluation of the impact of urban renewal on property values, a 1985 study**** "Neighborhood Conservation, An Evaluation of Redevelopment in Shooks Run" by a UCCS group lists the relocated house at 701 E High Street in a sample of eight properties in Table IV: "Rehabilitated Residences - Publicly Funded Appreciation of Value", p 12. Summary of permits found for houses located within the Penrose Main expansion area to the east - bounded by Madison on south & Jackson on north, and Tejon on west & Nevada on east, and includes one block of Monroe, and one block of Tyler. The permits (public records) were found on the Pikes Peak Regional Building web site, www.pprbd.org. The PPRBD does not keep additional from/to address info not already on a "move" permit. I've added the El Paso County Assessor residence property schedules (now inactive) from its web site, and many from/to relocation addresses for moved houses provided by Ms. Ayles of the Assessor's office. In the "photos" column, "o" means original-location photo from assessor file, "y" means I've taken current photos. Summary of permits found for houses remembered as possibly relocated. May or may not be from Penrose expansion area. The PPRBD does not keep additional from/to address info not already on a "move" permit. Photograph by Art W. Van Lopik, Courtesy of Special Collections, Pikes Peak Library District, 290-11073.
and showing house at 115 E Monroe. Photograph by Stewarts Commercial Photographers, © Pikes Peak Library District, 013-1026. Zoom of photo, showing 100 Tyler Pl house. Zoom of photo, showing 2223 and 2225-27 N Tejon houses. 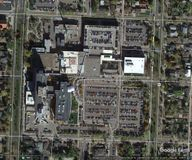 The Hospital expansion area ran from Tejon St. (now blocked) to Nevada Ave., and from Madison St. to Jackson St. (upper east-west street. ), completely replacing previous residential housing from about 1975 through 2000. In May 2017, acquaintance H. Murphy told me of a single story house on the west side of North Nevada she and a prospective buyer visited, recalling that it was most likely between Madison and Monroe. Subsequently the house was relocated to about 200 W Brookside as the top story, with the hillside lower level & foundation built on site for it. She remembers a small attached room with glass brick attached to the left side of house on Nevada, but not appearing on the house after moving to Brookside. I took pictures of the Brookside house (a corner lot), and searched PPRBD for possible relocate permits, but found no permits of any kind. 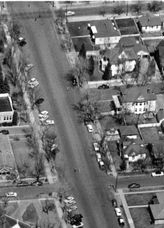 I brought up the case with Ms. Ayles, who found an archived assessment record and photo for the upper story from the Brookside street side, with address 1420 Ivy Place. The record shows it moved from 1410 Ivy Pl. 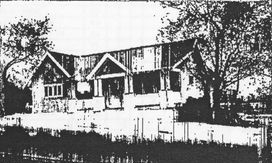 in 1984 to form a duplex. A building permit for 1420 shows foundation work in 1984; two for 1410 shows fire damage repair in 1981, and a mini storage warehouse being built in 1984. The current Assessor online records for 1420 show a photo of the duplex from the Ivy street side. No mention of movement from the Penrose expansion area. Public Records, Permission to Use, etc. The "from/to" addresses for the relocated houses, and the black/white house photos kept in inactive tax assessment archives for the original pre-expansion property locations are all public records obtained from the El Paso county, Colorado Assessor's office, in accordance with Colorado's Public Records law. My phone discussion with Assessor Steve Schleiker on 6/21/2017 confirmed that there are no Copyright restrictions on the use of the archived b/w file photos nor with the residence photos accessible via the Assessors Public Record Real Estate Property Search website. Similarly, Building Permit information used here is publicly available from the Pikes Peak Regional Building Department (PPRBD). Attribution information for the Google Earth photos on this page, the "Expansion: Moved Houses" page and the "Tejon & Nevada Streets..." page is contained and displayed within the photos. For Gazette articles referenced on pages "Tejon Street and Nevada Avenue" and "Madison & Monroe Streets, and Tyler Place", links to the articles are used instead of posted photo images, since direct posting of Gazette articles on other web sites is prohibited by Gazette copyright policy. * "Penrose Hospital, Colorado Springs, Colorado: long range plan report, 1974", Chicago: Metz Train Olsen & Youngren, 1974, Pikes Peak Library District (PPLD) Call Number 725.510978 P417L, in Special Collections. 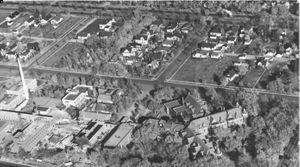 ** This 1940 aerial photo of Glockner Hospital from the south-east was later found in the PPLD digital collections as photo 290-11073. 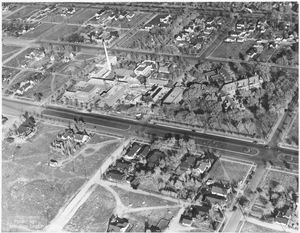 *** This 1956 aerial photo of Glockner/Penrose Hospital from the south, published in article "A look back", The [Colorado Springs] Gazette, Sunday, April 9, 2017, p A16, is in the PPLD digital collections as photo 013-1026. **** Neighborhood Conservation, An Evaluation of Redevelopment in Shooks Run, Center for Community Development & Design, University of Colorado, Colorado Springs, Edited by P. Kaufmann, 1985 (UCCS HT 168.C6 N44).